It is part of folklore in the south-east that when the Anglo-Normans arrived in Ireland in 1169-1170, Strongbow vowed to take Waterford City ‘by Hook or by Crook’ – referring to Hook Head in Co Wexford on the east bank of Waterford estuary, and Crook village on the west bank in Co Waterford. Later versions say the phrase was used by sea captains to express their determination to make the haven of the bay in bad weather using one headland or the other as a guide. Others imagine the phrase is derived from a vow by Oliver Cromwell to take Waterford by Hook or by Crook, by fair means or foul. 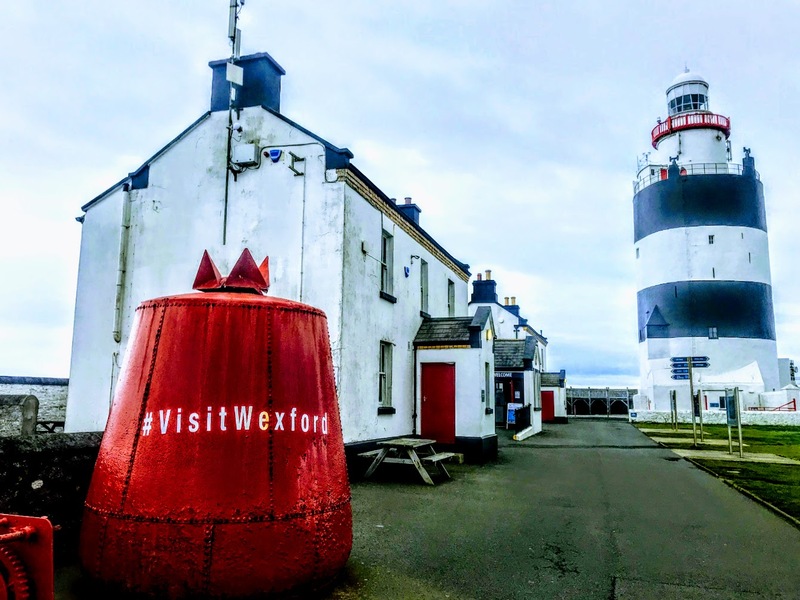 Recently I travelled from Waterford through New Ross, by fair means rather than foul, to visit the Hook Lighthouse at the end of the Hook Peninsula in south-west Co Wexford, which claims to be the oldest operational lighthouse in the world. It has been voted one of Ireland’s favourite attractions and visiting it is a truly unique experience. The present lighthouse traces its story back to the first purpose-built lighthouse, built 800 years ago in the early 13th century by Strongbow’s son-in-law, William Marshal, Earl of Pembroke. But a beacon may have stood on this site from the fifth or sixth century, associated with Saint Dubhán and his followers, said to have built the first Hook Church at Churchtown nearby. 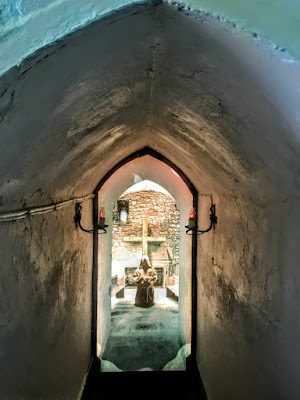 The monastery at Churchtown was founded by Saint Dubhán in the early fifth century. The peninsula became known as Rinn Dubháin (Dubhán’s headland). According to tradition, the monks kept a warning beacon to warn sailors of the dangers of shipwreck on the rocky headland. Tradition claims Saint Dubhán set up a form of beacon as early as the fifth century. The Hook is known in Irish as Rinn Dubháin, Saint Dubhán’s Head. His name sounds like the Irish word duán, meaning a fish hook, and so Hook Head acquired its name in English. The Anglo-Normans landed in 1169-1170 at Bannow and Baginbun in south Wexford and Passage in Co Waterford, all visible from Hook Lighthouse. They quickly took over much of the south and east of Ireland, and Richard de Clare, Earl of Pembroke (‘Strongbow’) became Lord of Leinster. Strongbow’s daughter Isabella married the powerful knight William Marshal in 1189, and he succeeded his father-in-law as Earl of Pembroke and Lord of Leinster. He founded New Ross, 30 km up river, as the port of Leinster, and in the early 13th century he began to develop Leinster, building castles, founding towns and bringing in English tenants. The precise year of building the lighthouse is not known, but Marshal first came to the area in 1201, he died in 1209 and the first map that shows the lighthouse serving its function is dated 1240, so construction must have taken place between these dates. He probably built the tower of Hook in 1210-1230 as a landmark and light tower to guide shipping to his port at New Ross. Exhibits in the lighthouse suggest Marshal was inspired by the Pharos or Great Lighthouse at Alexandria and the Crusaders’ Lighthouse at Acre which he would have seen during the Crusades. The small group of monks at Hook Church at Churchtown nearby were the first custodians of the light. They became the first light-keepers and may have helped to build tower. For centuries, the light was provided by a coal-fire beacon. The monks lit warning fires and beacons all through the years to warn sailors of the dangerous rocks on the peninsula. Hook Lighthouse is a fascinating example of mediaeval architecture. The tower stands four storeys high, with walls up to four metres thick. The tower has three rib-vaulted chambers in the lower tier, while the upper, narrower section would have carried the warning beacon. These two tiers are connected with a mural stairway of 115 steps within the wall. The tower was built of local limestone and the original building survives intact. 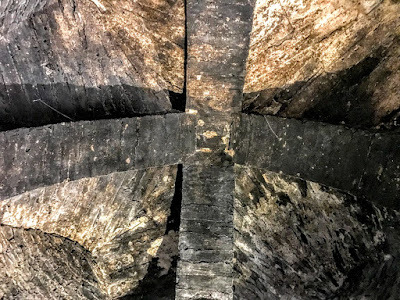 The first tier is 13 metres in diameter at the base and has three storeys, each with its original 13th-century stone fireplace. The thickness of the wall contains a number of mural chambers, including two garderobes or toilets. The upper tier is 6 metres in diameter: originally it supported the beacon fire, which was later replaced by the lantern. Mediaeval references dating from 1245 show how the chaplains of Saint Saviour of Rindeaun, or Hook Church at Churchtown, were urged to maintain the lighthouse. The monks left the tower at the dissolution of the monastic houses during the Reformation and were replaced by the lighthouse keepers. For several centuries after it was built, the Tower remained under the control of the civic authorities in New Ross. Annually, the Sovereign or Mayor of New Ross and the burgesses or town councillors asserted their authority over the waters at the Hook by firing an arrow into the sea at Hook Head. 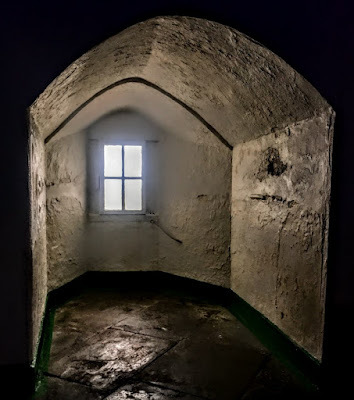 A new, coal-burning lantern was installed at the top of the tower in 1671 to replace the old beacon light, and further improvements were made in 1704. Meanwhile, the ownership of the Hook and the tower passed to Henry Loftus of nearby Loftus Hall. 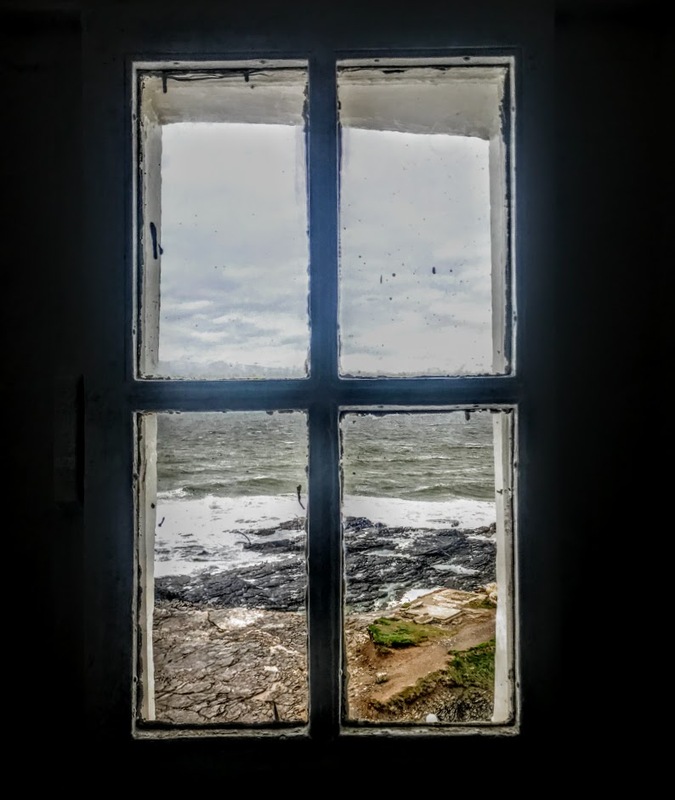 Nicholas Loftus, known as the ‘Extinguisher,’ threatened to close the lighthouse in 1728 unless the authorities agreed to an increase in the rent he collected. The coal fire was finally abandoned in 1791 when a whale oil lantern 12 ft in diameter was installed with 12 lamps was installed. An Act passed by Parliament in 1810 transferred control of all lighthouses on the Irish coast to the Corporation for Preserving and Improving the Port of Dublin. 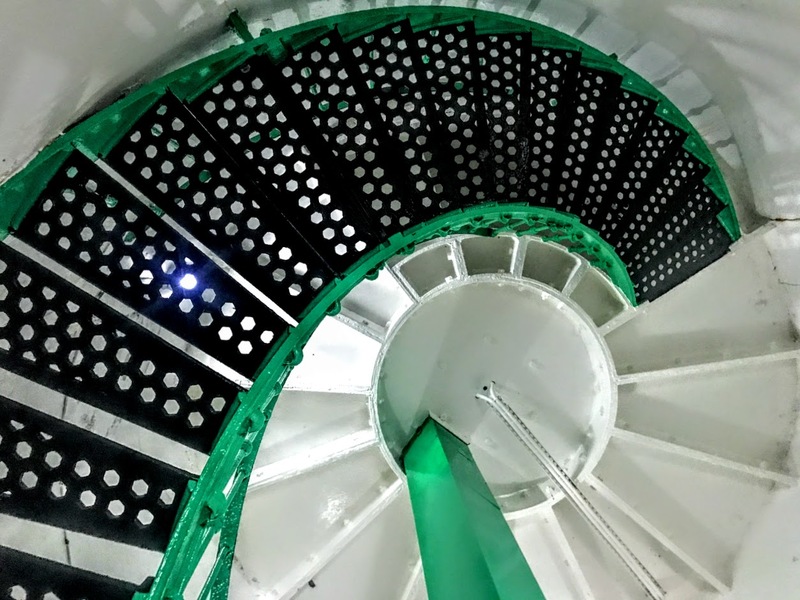 New gas lights were installed in the Hook Lighthouse in 1871, lit by gas manufactured in the enclosure known as the gas yard. Fog signals at the lighthouse were a warning to seafarers during dense fog that can descend suddenly on the peninsula. The fog signal was essential in days before radar and radio. Fog guns at the cliff edge were fired every 10 minutes. These were replaced by explosive charges set off at the top of the tower on an extending arm. Finally, a compressed air horn or hooter blasted every 45 seconds during fog. Three houses were built for the lighthouse keepers in the 1860s. Paraffin oil became the source of power in 1911, and a clockwork mechanism changed the light from fixed to flashing. This mechanism had to be wound up every 25 minutes by the keeper on duty. Finally, in 1972, electricity became the power source, and light-sensitive switches were installed to control the lantern. The Hook Lighthouse was converted to automatic operation in March 1996, and the last light-keepers who had climbed the stairs and tended the light for generation were withdrawn from the station. The lighthouse. The Hook’s foghorn was heard for the last time in January 2011, when all the foghorns were turned off. It was felt that the technology on modern ships was so advanced that the foghorn was no longer needed. The lighthouse is now operated by the Commissioners of Irish Lights, the Irish lighthouse authority, and is monitored remotely from Dun Laoghaire. Despite local claims, the Hook Lighthouse is the second oldest operating lighthouse in the world, after the Tower of Hercules in Spain. The old keepers’ houses were turned into a visitor centre and the lighthouse was opened to the public as a tourist attraction in 2001. The visitor centre includes a gift shop, art workshop, exhibits and a café, and guided tours are available seven days a week. 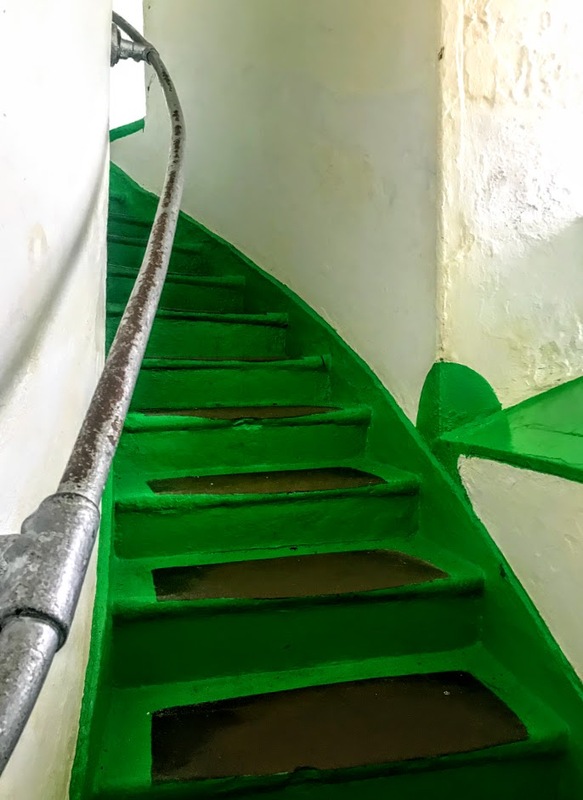 The guided tour takes visitors up the 115 well-worn spiral steps of the tower to explore the thick-walled chamber, following in the daily and nightly steps of the former light keepers. A life-sized hologram figure of Saint Dubhán tells of dark and cold nights spent with his fellow monks in the fifth century warning sailors against the dangers with a beacon they kept alight on the headland. Further up, Strongbow’s son-in-law, William Marshal, is introduced as ‘the greatest knight that ever lived.’ Marshal’s hologram tells of his empire in south-east Ireland and how he built the lighthouse tower in the 13th century to guide shipping up the estuary and the river to his port at New Ross. The balcony offers spectacular views across the Hook Peninsula, over Waterford Bay and out across Saint George’s Channel, where the Irish Sea meets the rolling Atlantic. No 6: Where am I? No 2: In the Village. No 6: What do you want? No 6: Whose side are you on? No 2: That would be telling. We want information… information… information. No 6: You won’t get it. No 2: By hook or by crook, we will. 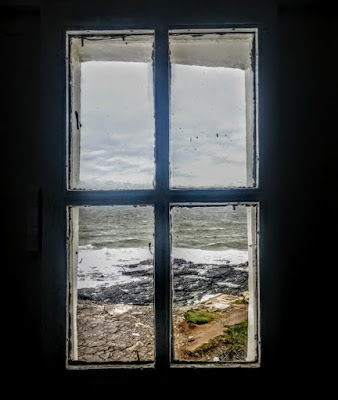 Having visited the Lighthouse at Hook Head, I went in search of the origins of the phrase ‘by Hook or by Crook’ – did it originate with Strongbow’s determination, or Cromwell’s, to capture Waterford, by fair means or by foul? It is highly unlikely that Strongbow spoke English, still less that he spoke it well enough to make rhyming puns in the heat of battle, or that he knew the intimate details of local topography long before the area had been conquered – or properly mapped. The first recorded use of the phrase ‘by hook or by crook’ is in 1380 in the Controversial Tracts of John Wyclif. The origin of the phrase is obscure, with one explanation that it comes from the customs regulating which firewood local people could take from common land: they were allowed to take any branches they could reach with a billhook or a shepherd’s crook. So, the phrase was already in use for almost 300 years before Cromwell’s arrival at the gates of Waterford, which deprives historians of finding even a hint of humour or witticism in his language and commands.